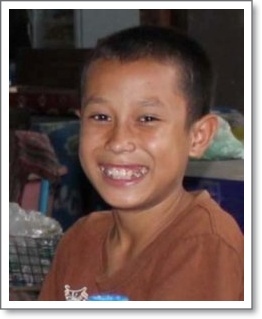 Mr. Somvang SEANTHAVISOUK, He is a child who is gratefulness person, Despite the fact that he will be born in poorest family in addition his parents had been divorce and both of them separated to get a new married with another person, And they have never come back to take good care of him anymore, Mr. SEANTHAVISOUK, he only lives with a grandmother as two people. As part of grandfather passed away in years, His grandmother has the occupation as making the glutinous rice cakes (Khao Tom) for sale, an income of every day is only enough for the daily payment in each day, but it won’t be remained to the saving for the education of Mr. Sonvang in the future. Currently, Mr. Somvang is at the ages of 13, though the life style of his will be difference from the other perfect kids. Mr. SAENTHAVISOUK has no times not to take part in playing football with the friends in the evening or weekend (Saturday and Sunday) which is a sport he loves so much because of his most of free time is with helping the grandmother to make the glutinous rice cakes (Khao Tom) at home in order to bring it for selling at the market. After schooling, in evening of every day, Mr. Somvang has to go home in hurry for coming to help the grandma to take the glutinous rice cakes (Khao Tom) to sell in the market, if which days the glutinous rice cakes (Khao Toum) be sold out will eat a good and expensive food, actually. But if which days the glutinous rice cakes (Kho tom) do not be sold out, a meal in that day will be an instant noodle as the income that grandmother gets a little bit around 20,000 Lao Kip – 30,000 Lao Kip per a day. At the present, the grandmother of Mr. Somvang is 58 years old, her health is not strong and healthy like previously, the grandmother is so worried about his future as she is afraid that if she is died, nobody will take care of Mr. Somvang to continues from her, a part of Mr. Somvang’s own self got understood to the worry of the grandmother felt for him, one thing he can do now like try to pay more attention to study excellent and comes to school without absenting. Mr. Somvang has a dream of being a policeman, because it is the responsibility of the man that should have a part jointly in defending the sovereignty of the country, but how will he achieve successfully?, Who supports and promotes him to reach that dreaming?, If he will depend on his grandmother, it is tough impossible as he doesn’t know that how long the grandmother will be with him including only bit income is enough for the livelihood each day. Nowadays, the educational side Mr. Somvang and grandmother won’t be worried much because of luckily, he still get scholarship from EDF-Lao at least it could help him to graduate the education in Junior High School Level and his own self is so proud of still having a generous person to provide support the educational aspect, Mr. Somvang will try to struggle and pay much more attention to learn for achievement progressive in the future and for making the life better every day.